Tribune Chronicle / John Vargo Youngstown State's Chelsea Olson (12) drives on Northern Kentucky's Kailey Coffey (23) as YSU's Sarah Cash (23) trails the play. 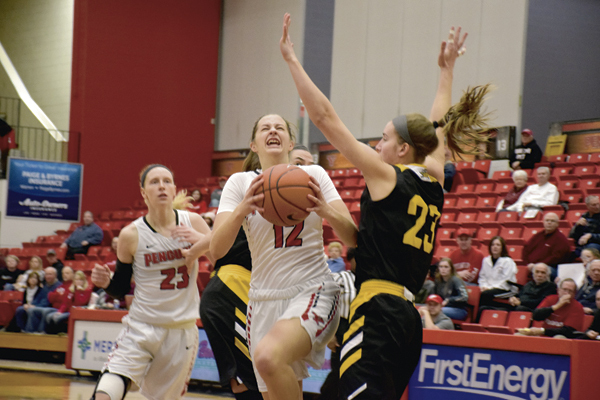 The Penguins rallied to beat the Norse, 77-66, on Monday in Youngstown. Tribune Chronicle / John Vargo Youngstown State’s Chelsea Olson looks to pass as Northern Kentucky’s Kailey Coffey defends. YOUNGSTOWN — Frustration mounted for the better part of three quarters. 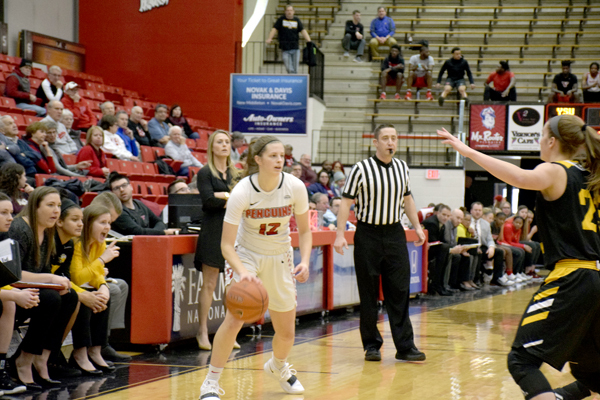 This Youngstown State women’s basketball team couldn’t muster much against a three-win Northern Kentucky team. Calls weren’t going YSU’s way, and even the level-headed Penguins coach John Barnes seemed on the verge of a very rare technical foul. The Norse appeared to have things well in hand during what seemed to be an upset special at the Beeghly Center. Enough was enough with about two-and-a-half minutes left in the third quarter. NKU held a 14-point lead, but the Penguins started to chip away and eventually surpassed the Norse, 77-66. Tribune Chronicle / John Vargo Youngstown State's Chelsea Olson looks to pass as Northern Kentucky's Kailey Coffey defends. YSU (14-5, 6-2 Horizon League) went on a 21-3 run after being down 54-40 with 2:26 left in the third quarter. Mary Dunn, who had a game-high 23 points and 11 rebounds, had back-to-back three-point plays to tie the game at 57 with 5:30 remaining. She had one of her game-high five blocks soon after her second post success. It got the Penguins — and Sarah Cash — going. Cash added 12 points and eight rebounds. YSU had 10 blocked shots (the most since March of 2009), with six coming in the fourth quarter, where the momentum shifted. Cash is the fourth different Penguin player to receive league POY honors. She had 22 points, was 8-of-14 from the floor and 6-of-6 from the line in Friday’s Wright State win to earn the Horizon honor. Kailey Coffey and Taylor Clos combined for 35 of the Norse’s 66 points. Garfield High School graduate Grayson Rose, a starter for Northern Kentucky (3-14, 2-5), had four points and five rebounds. The Norse were 9-of-21 from 3-point range, much better than they normally shoot. “They came out playing loose, attacking, aggressive, shooting,” Barnes said. “We missed some assignments. We missed some mental things that we wanted to do, which hurt us early. McKenah Peters had 18 points, was 3-of-5 from the floor, 3-of-4 from 3 and 9-of-10 from the foul line. Chelsea Olson had seven rebounds, part of the 33-to-24 advantage the Penguins had over NKU on the boards. The two had a pair of 3-pointers at the end of the third quarter to start the 21-3 run. YSU outscored the Norse 31-12 in the fourth quarter. It was 6-foot-3 Dunn and 6-1 Cash who dominated Northern Kentucky, and the duo is a force most teams in the Horizon League cannot overcome. The early lull in Monday’s game could be traced back to Sunday’s leaky roof, which delayed this Horizon League battle to Monday. YSU got on the court before 8 a.m., Sunday for a walk-through only not to play. NKU has the same issues. Both were anxious to play yesterday. That was exactly what Dunn and her teammates wanted to show, which came to fruition in the fourth quarter. Monday, it was a lesson learned.